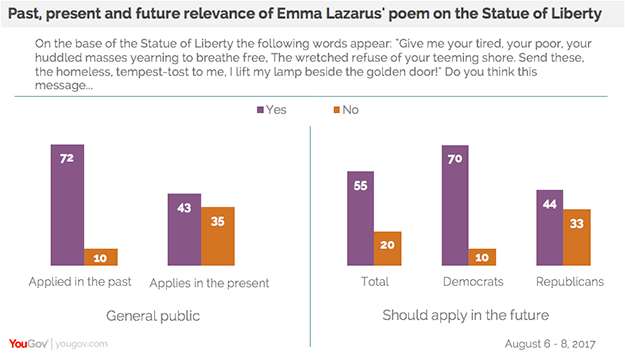 August 09, 2017, 9:30 p.m.
Americans may not be ready to scrap the Emma Lazarus poem inscribed on a plaque at the base of the Statue of Liberty: “Bring me your tired, your poor, your huddled masses yearning to breathe free...” According to the latest Economist/YouGov Poll, many have compassion for those now here illegally. But they remain concerned about illegal immigration, nationally if not in their own communities. An exchange between CNN reporter Jim Acosta and White House senior policy advisor Stephen Miller over immigration policy last week brought Lazarus’s poem, “The New Colossus,” into public view once more. Americans are sure that its welcoming sentiment once applied to the United States, but are less sure it applies today. And whether it should apply to the future evokes clear partisan reactions. Seven in ten Democrats, but fewer than half of Republicans, say this welcome should apply in the future. Republicans are more concerned about immigration than Democrats. More than half of Republicans describe immigration as a very important issue to them; just over a third of Democrats and independents say the same thing. Immigration was a major issue in last year’s Republican primaries, as Donald Trump famously promised to build a wall on the border with Mexico and have Mexico pay for it. It’s something Republicans want: Republicans favor building that wall 71% to 18%, but Democrats and independents reject it. Overall, 37% of the public wants to build a wall, 46% don’t. 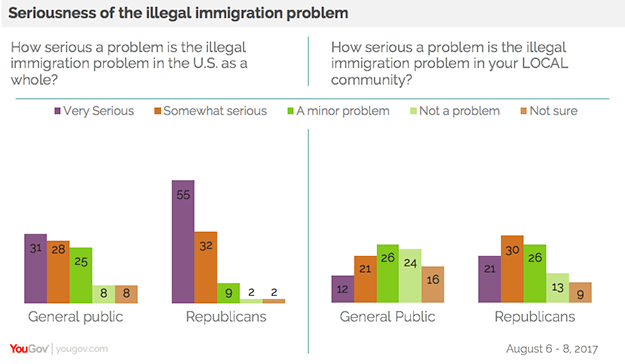 Most Americans view illegal immigration as a serious problem for the nation, but not necessarily in their own communities. Republicans are more concerned: nearly nine in ten call it a serious problem nationally, and a majority see it as a problem in their own communities. Republicans want more stringent measures when it comes to immigration. 59% of Republicans would reduce legal immigration by half, a proposal supported by only 37% of the total adult population. 58% of Republicans would force those currently here illegally to leave, something only 35% of Americans overall agree with. Among the entire public, 52% would allow illegal immigrants now in the country to stay and apply for citizenship. Another 13% overall would let them stay, though not be permitted to become citizens. As for the Trump Administration’s announcement of support for the RAISE Act, introduced by two Republicans Senators, results are mixed. It was this bill that generated the argument over the meaning of the Statue of Liberty last week. The RAISE Act would create a merit-based system, rewarding English-language ability, high-paying job offers, and entrepreneurial initiative, among other qualifications. It would continue to allow close relatives of residents to enter the US. Americans like some but not all of it. And Republicans are divided on several of the bill’s provisions. Of these four items, having a close family member who is a citizen is the most popular, followed by having a close family member who is resident here. 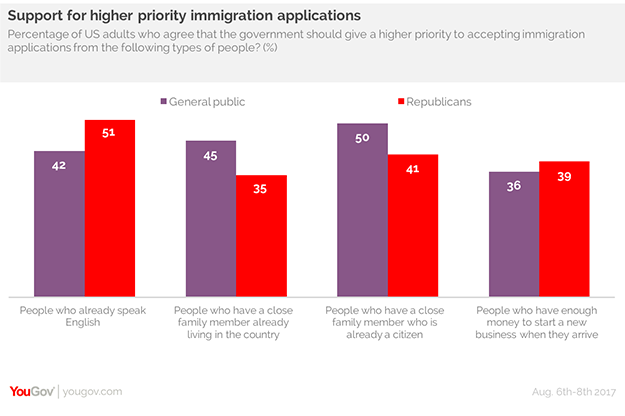 But Republicans are split equally on whether close family members of citizens should get higher priority, and they oppose giving priority to close relatives of residents. 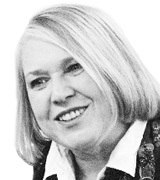 Having the wherewithal to start a business gets as much opposition as support. And on this Republicans and Democrats agree. English-speakers would get priority from Republicans and from independents, but not from Democrats. Overall, slightly more would give English speakers a higher priority than would not. One other possible disagreement with the Trump Administration: most would give priority to those escaping from war zones, which these days would likely mean those from places that the Administration has already tried to keep from entering the country, at least temporarily. 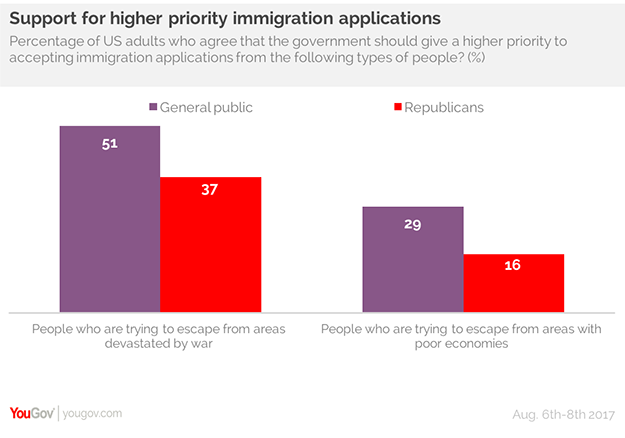 There is less willingness to give priority to those escaping from poor economies, which suggests that many Americans agree with the proposal’s premise of reducing immigration from low-skilled, poor people. More disapprove than approve of how Donald Trump is handling immigration overall, though the division is close to the President’s overall approval – in this week’s poll, 37% approve of Mr. Trump’s overall performance, 53% disapprove. On immigration, 41% approve and 46% do not. See full results here or toplines here.